Boss Ballet Barres provides the strongest free-standing dance and fitness barres available in North America. Popular with studio owners, schools and home-users alike, they are the first choice for some of the biggest names in dance and fitness. 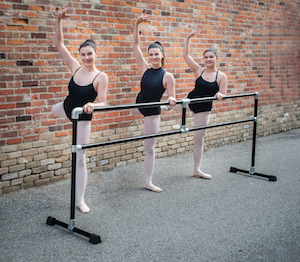 Using a patented design and high-strength structural steel, all Boss Ballet Barres come with a Lifetime Guarantee. You will see our Barres in some of the most famous professional dance companies across the continent, as well as many colleges and universities. From one of our smaller, affordable 4- and 6-foot Intermediate Barres, all the way up to our longest 14-foot Extended Boss Barre Pro series, every one of our barres is constructed from the highest-quality components, and individually inspected with care before shipping, every time. Feel free to contact us any time at info@balletbarresonline.com to discuss your barre needs. Our 10ft (120 Inch) Extended Boss Barre Pro is a specially-engineered version of our Pro Barres. The latest design to come out of our R&D Department, a special process was created to add extreme tensile strength and deflection-resistance to the middle of the barre. This allowed us to eliminate a third upright leg in the center of the horizontal bars, and have very minimal "sag", if any at all. Our Boss Barre Pro Series consists of our strongest barres, using a larger diameter tube than our Intermediate Barres, for maximum strength when being used by 5-6 dancers in a school or studio setting. This strength allows for extra durability in a daily-use environment, while the smooth powder-coated finish retains its appearance for many years. Already in use in schools and studios across North America, our Pro Barres are the premium choice for instructors, professionals and competitions. The largest Pro Barre option, our 14ft (168 Inch) Extended Boss Barre Pro can be used by 10 dancers in a school or studio setting.